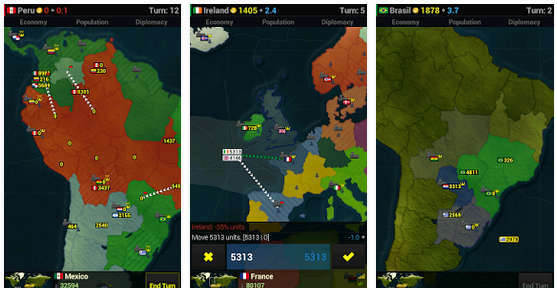 Virtually conquer other countries and take over the world in the new Android game 'Age of Civilizations'. 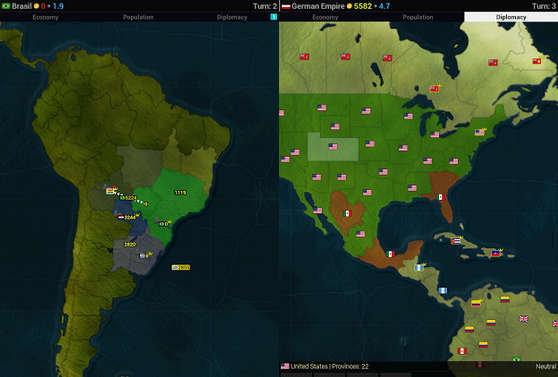 The game is a turn-based strategy in which you are the leader of a country that would like to be the topdog of the entire world. Use your real-time strategy skills and flex your brain to figure out your next move. - Two kinds of maps: Earth, which has 324 provinces and Kepler-22b, which has 404 provinces. - Orders are submitted before each round. The number of orders you can submit during each round is limited by your Movement Points for that round. - After orders are submitted, civilizations execute actions in turn order, which is randomized at the start of each round. - Declare war on a civilization. - Submit a peace offer to a civilization. If accepted, your civilizations will no longer be at war. - Submit a pact offer to a civilization. If accepted, the civilizations cannot attack each other for five rounds. This can be canceled through a War order one round in advance. - Move units from one province to another. You can move between provinces you control or attack another civilization’s province. - Recruit units from the selected province. This costs money and is limited by the population of the province. Recruiting from a province reduces its population. - Construct a building in the selected province (see Building Types). This costs money. - New scenario: World War II - 1942 made with a fan, Jim K.